On Dec. 7, 2017, Waypoint Centre for Mental Health Care was pleased to have the Hon. 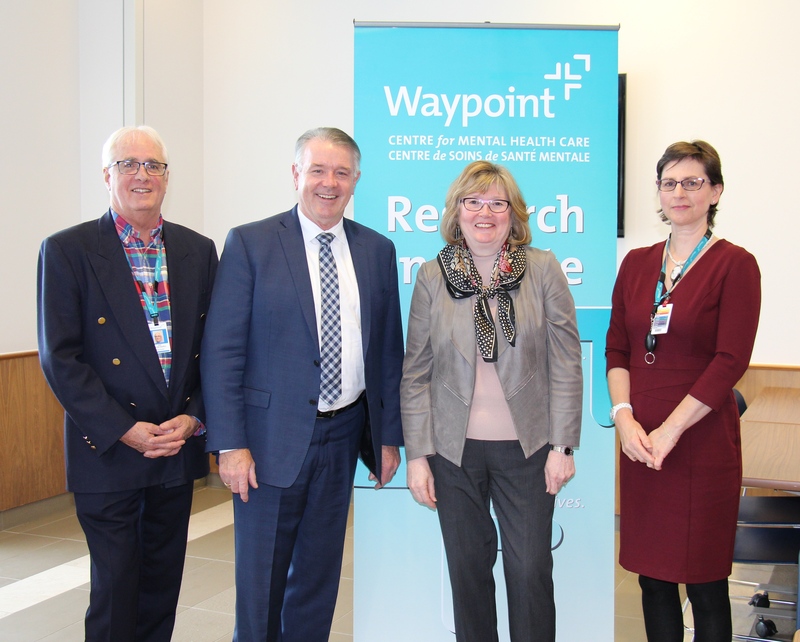 Kevin Flynn, Minister of Labour, on site to announce a grant of more than $240,000 supporting research on trauma among psychiatric workers, a joint project of Waypoint and The Royal Ottawa Health Care Group. The project is examining workplace events associated with trauma and barriers to accessing supports to prevent and alleviate post traumatic stress disorder symptoms. It is also helping to build workplace plans to reduce trauma-related problems and support psychiatric workers seeking help. This project began two years ago, when our researchers Dr. Zoe Hilton and Elke Ham invited staff to take part in a study of workplace experiences and the effects on staff. Over 200 staff participated, and they shared frankly about their experiences, feelings, and recommendations for improvements. With this study in hand, the research team approached a number of potential knowledge users to gain support for further research. The team has grown to include researchers and collaborators from Waypoint, the Royal Ottawa Health Care Group, University of Toronto, and the Public Services Health and Safety Association. This team is working with supporters at the local and provincial level, including OPSEU, the Ontario Nurses Association, and the Registered Nurses Association of Ontario. Waypoint’s Dr. Hilton, who is co-leading the research with Dr. Michael Seto from The Royal, noted that the grant funding greatly enhances the reach and effectiveness of efforts to understand how workplace factors impact experiences of trauma among workers who provide daily treatment and care for people with mental illness. Research studies and knowledge user consultation activities will be taking place at Waypoint and at the Royal Ottawa Health Care Group over the next two years. Affected workers are encouraged to seek help if they need it, and resource information is provided. A consultation event, “Trauma among Psychiatric Workers, Building the Bigger Picture Together,” is planned for May 14, 2018, to coincide with the Waypoint Research Institute’s 6th annual conference.